Surfer Blood were one of the most blogged-about acts of 2009, and they have very recently released their debut LP, ‘Astro Coast’. Those who stayed up to date with the indie trends of 2009 can probably hazard a guess at the type of music these guys play. 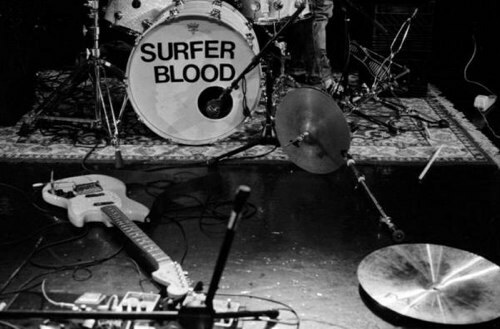 Surfer Blood’s music is stripped back, guitar-driven, hooky pop music. They are in many ways like Girls with hooks, which can only be a good thing. Case in point is the song Swim (To Reach The End), which at first sounds like it wouldn’t be amiss as part of Girls’ ‘Album’, but then breaks out into a great guitar hook and chorus that sounds truly unique to Surfer Blood. Ironically, apparently none of the members of Surfer Blood actually surf, however despite this they have perfectly captured the mentality and carefree life of the person who lives to catch those waves. The band hail from Florida, which is of course fitting given their name and the style of music they play, but yet they are touring all around America in the coming few months. This is a band that are perfectly suited to the beach party that was 2009 indie music, even if their debut was only released this year. This may be a sign that the lo-fi surf music trend is going to continue this year, or it may merely be that Surfer Blood are latecomers, but either way there’s no reason not to just enjoy this band’s music for what it is. I won’t write too much more now, because I am still in the process of digesting their debut album in its entirity, but stay tuned for a review of ‘Astro Coast’. In the meantime, enjoy Swim (To Reach The End).